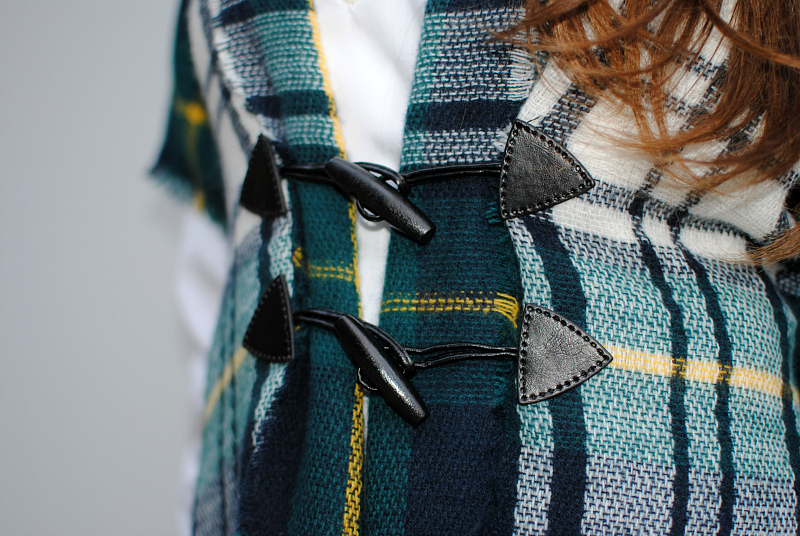 Maybe it's my Scottish heritage but I love all things plaid. It's my favorite print and usually what I look for when shopping for fabric this time of year. I have several scarves that have been hanging in the closet for over a year now. Scarves really aren't my thing, I don't wear them as a neck accessory and it doesn't get cold enough in Georgia to be practical. 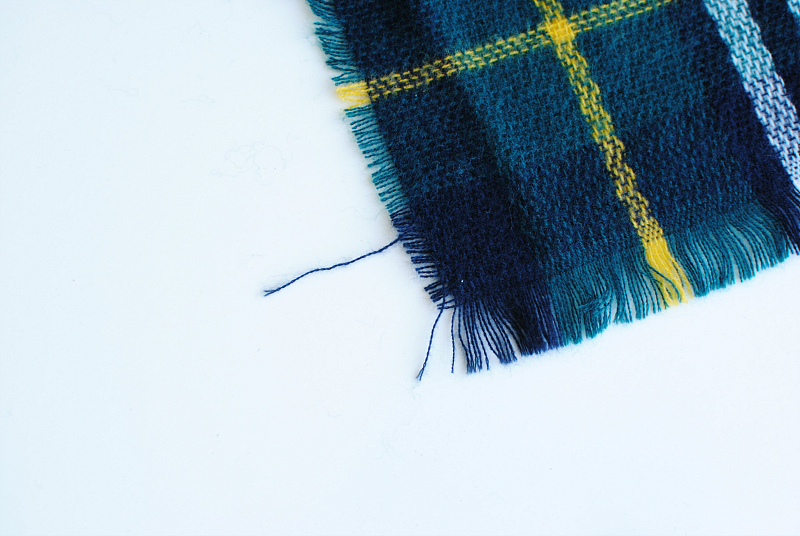 My mom's family is the well known Campbell Clan of Scotland and hunter green with yellow stripes is the Campbell plaid. 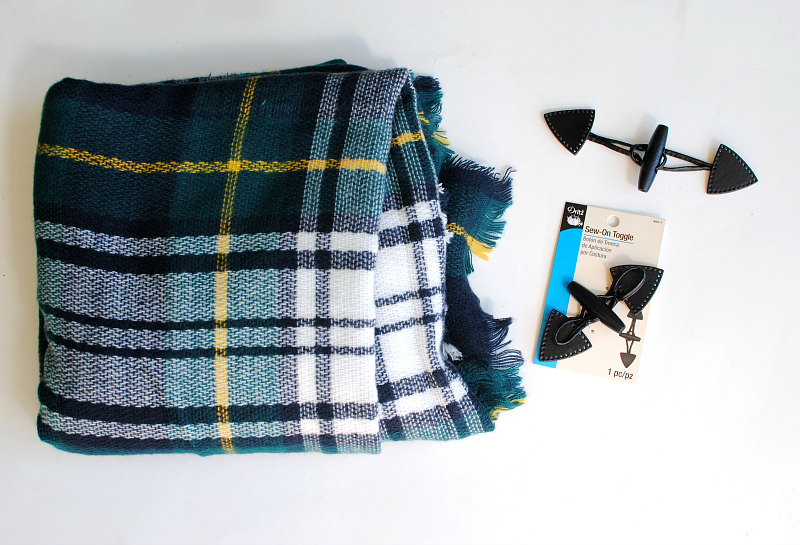 Every year my Grandma use to make us ponchos, so when I saw this blanket scarf that matched our plaid I wanted to do just that. 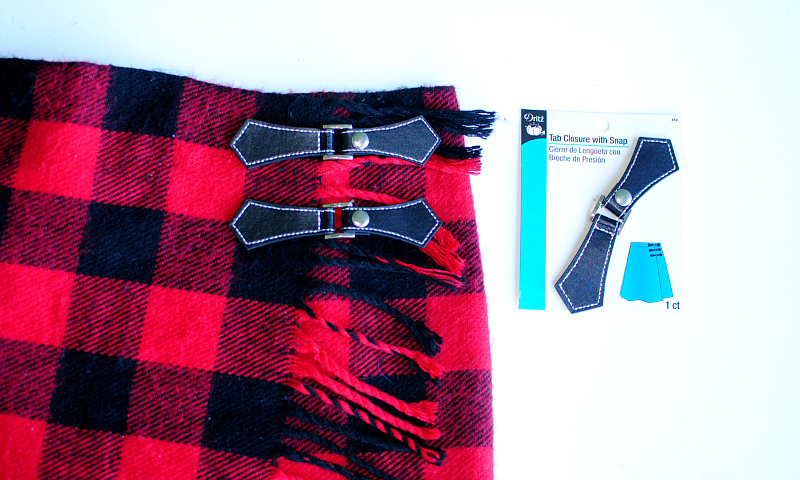 Dritz has many different closure options and when I saw these Sew-On Toggles I knew they'd be perfect for this poncho refashion. 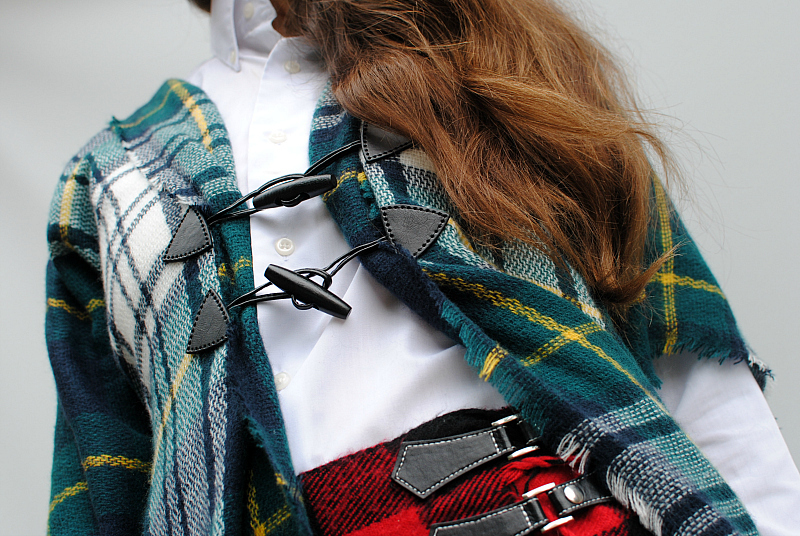 The modern "kilt" is made from a scarf as well using their Tab Closures. These are simple updates you can create in no time. 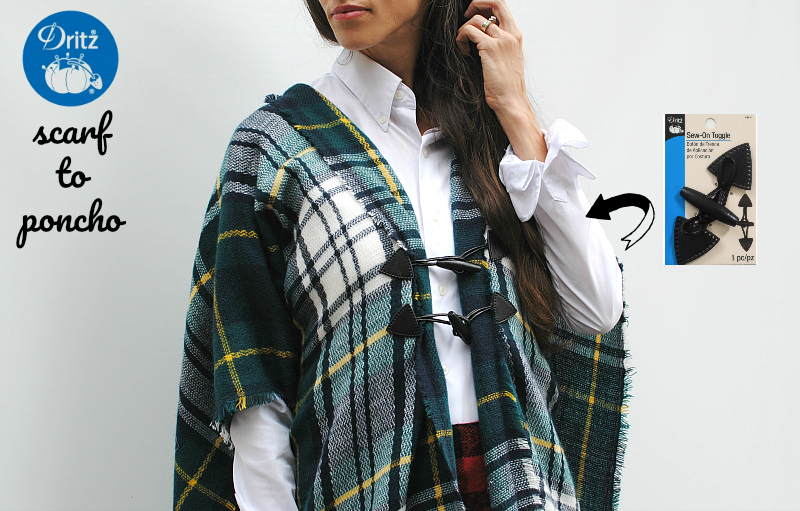 Get the details below to make your own Toggle Poncho and Modern Kilt. 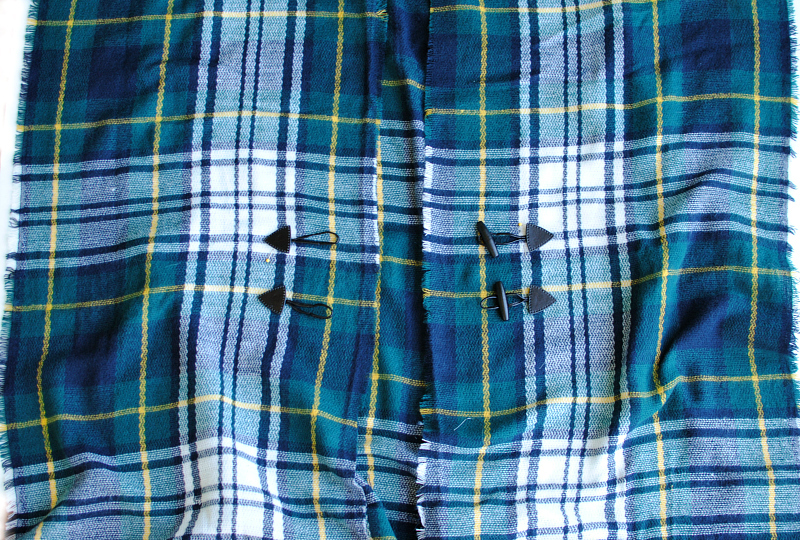 The kilt was very simple. I just wrapped the scarf around my waist and placed the closures to secure it. I wanted the fringe to be on the front side. 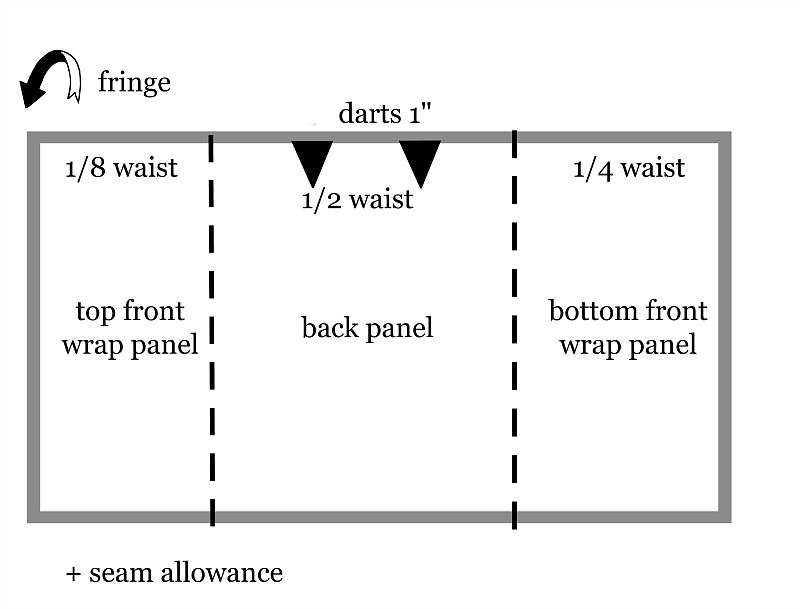 Refer to the pattern template on how to create the wrap skirt. I didn’t create any side seams and just wrapped the scarf around my waist. You may want to add darts in the back if fitting is an issue. I placed the tab closures where I wanted them and topstitched them into place following the stitches with invisible thread. Repeat on the other side to secure the closure. 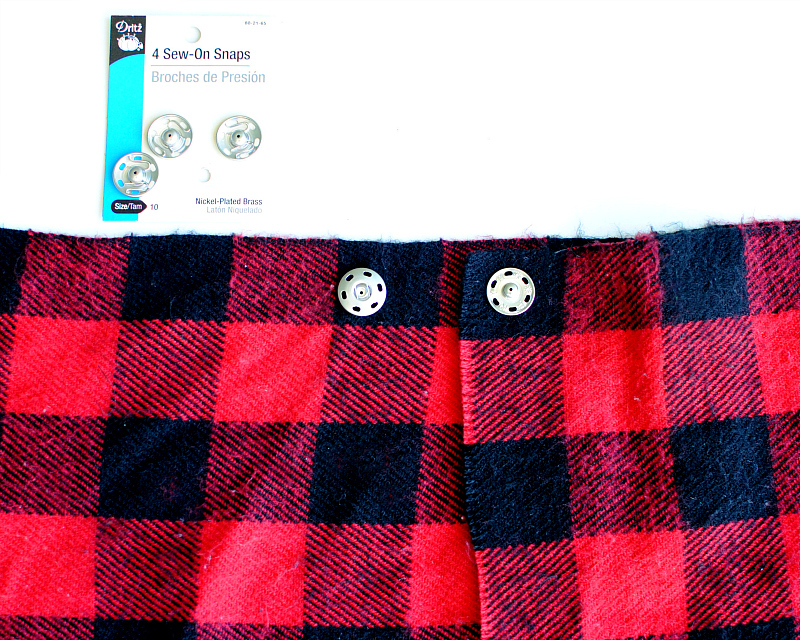 Add some Sew-On Snaps to keep it nice and snug on the other side front if it's falling down. 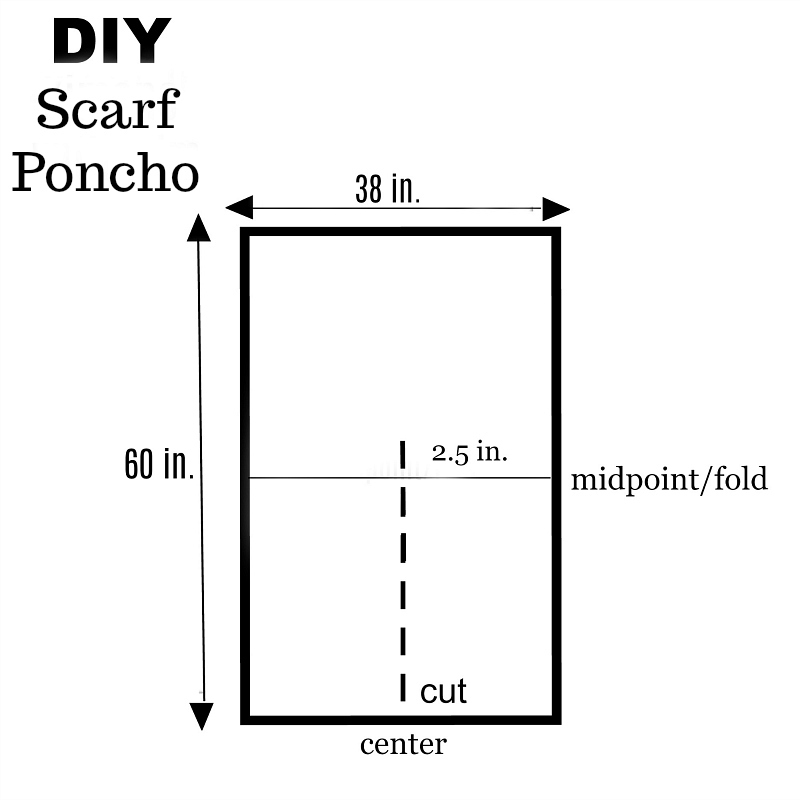 The Poncho is basically a large rectangle. All I did was cut from the bottom center to just a couple inches above midpoint as shown in the above photo. 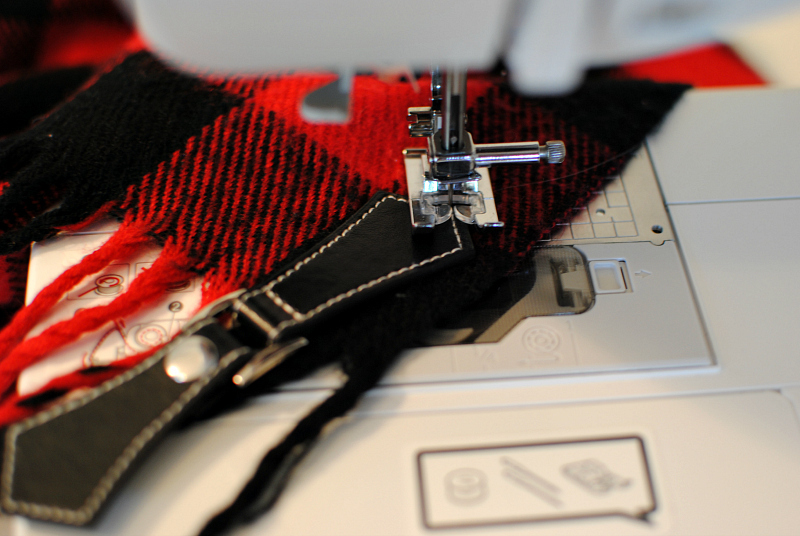 Measurements will differ based on the size your scarf. I wanted to keep the consistency of the fringe instead of sewing a hem down the middle so I just pulled out some of the string. Place your toggles wherever you'd like them to be. You can use masking tape to secure them. 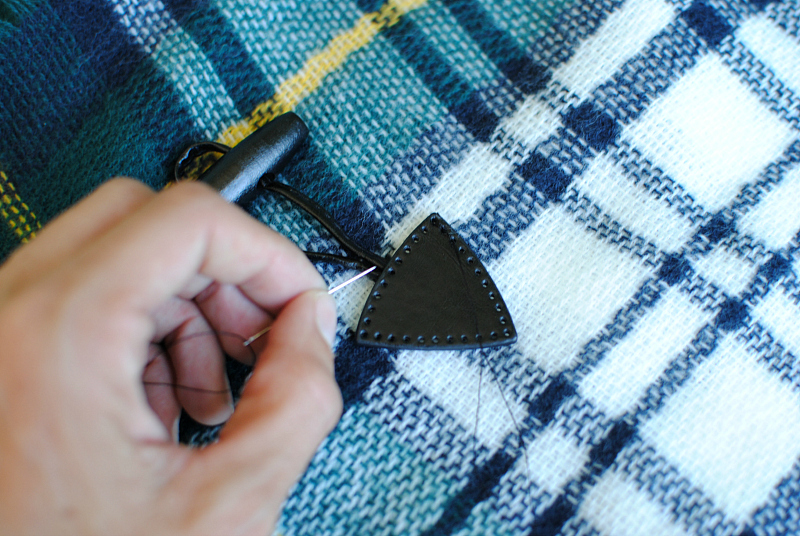 Generally the loop side goes on the right side of the garment. 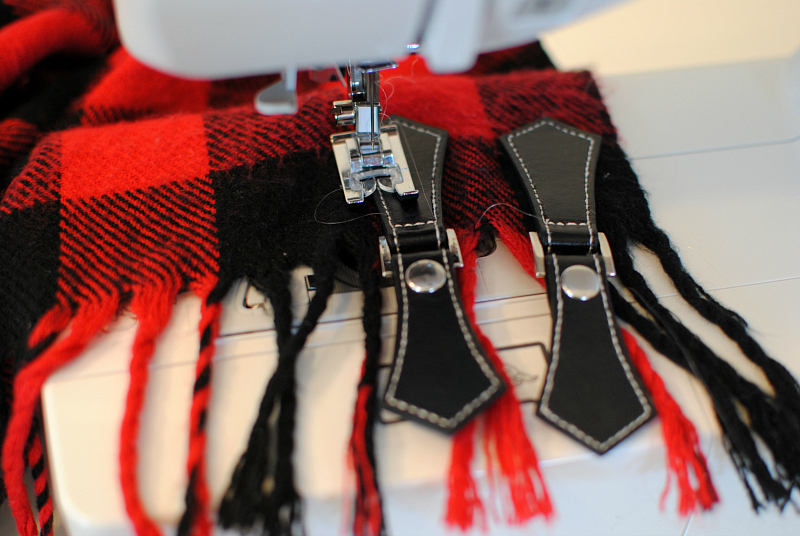 Hand sew them into place with embroidery floss (6 strands) or upholstery thread (this is what I did). 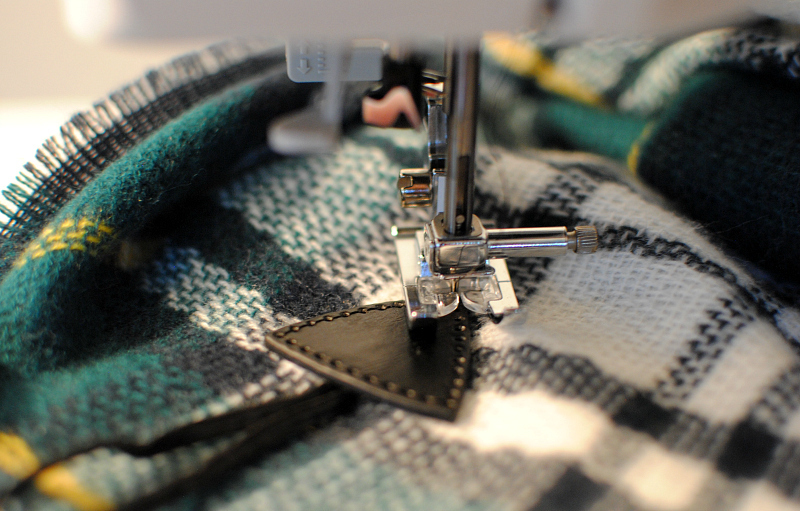 Another option is to use your sewing machine and set the stitch length to 4.0, then turn the needle knob by hand. I didn't use the pedal because it didn't always hit exactly into the holes. That way you can control where the needle and stitches go. Such simple updates with dramatic results. Now go get all your unwanted scarves. We are making wonderful writing papers with cheapest price. The high range of information can be notify to the papers for develop their knowledge. The first hand information can be posting in the writing papers. The writing service is having own writers and editing option is also available in our writing company. I have been looking to get the free coins house of fun online at this website and i am sure to get some useful hint to get the house of fun free coins. This video explains the complete recipe apple peanut butter bars and this dish is so delicious. 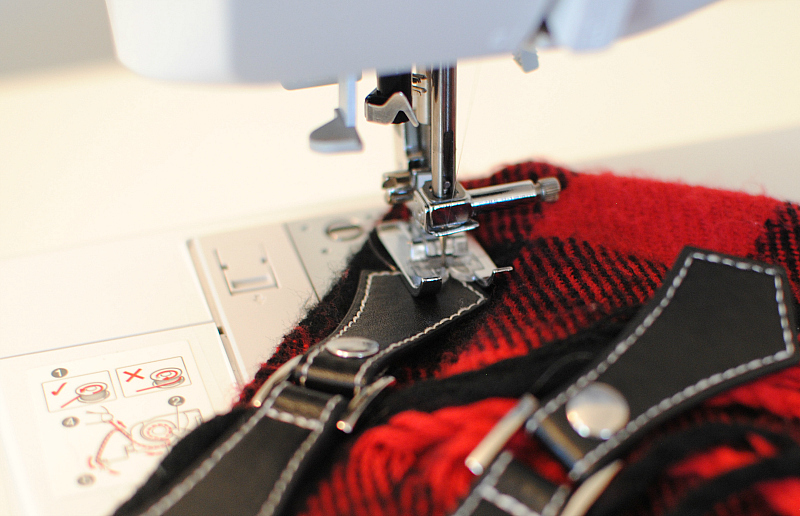 It is through the white paper that a lot of readers who want to buy software’s that meet their needs are able to make decisions on best basic sewing machine/entry level sewing machine/sewingmachinebuffs.com. This means the document can easily be used for commercial purposes. However, ensure that your paper is up to speed with information helpful to the reader. If you want to achieve success, you should have your own style. I'm a writer and I always try to do this. And this helps me to deal with writer's block. Nothing is cooler than blending your ideas and animation. We call it best explainer videos, and for that we just have the best taste for the job.